OTTAWA, Ontario, Nov. 6, 2018 /PRNewswire/ -- Long known for defining the "gold standard" of refining and bullion coin manufacturing, the Royal Canadian Mint is proud to celebrate its Gold and Silver Maple Leaf bullion coins (GML and SML), with a pair of innovative collector coins. Marking its 40th anniversary in 2019, the GML is being honoured with an extra-low mintage 99.99% pure gold kilo coin incorporating finely machined background radial lines, a security feature that is standard to modern GMLs, but which appears for the first time on a Mint kilo coin. The 30 year-old SML is getting its own special anniversary tribute in the form of a 2 oz. 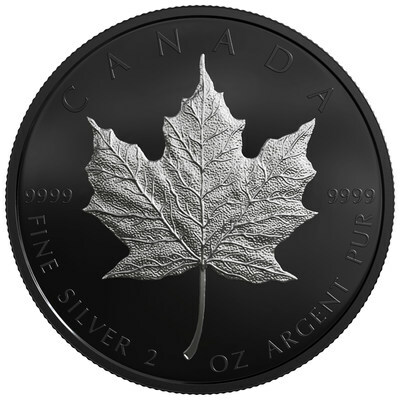 pure silver coin, with black rhodium plating surrounding the iconic maple leaf reverse design and the obverse effigy of Her Majesty Queen Elizabeth II. These elements dramatically shine out from the coin in their natural silver brilliance. Always looking to innovate, the Mint is also launching the 2019 $50 Fine Silver Coin â€“ Polar Bears: Mother and Cub, an impressive 5 oz. silver coin shaped in the rough contours of ice floes drifting across an Arctic seascape. In the coin's centre, Tony Bianco's design of a mother bear and her cub comes to life with the bright contrast of shimmering waters from which the realistically engraved bears are emerging. The same effect is achieved on the obverse, with the effigy of the Queen. Historic coins are also celebrated this month, starting with a kilo version of the Mint's famous "Voyageur" coin. The 2018 $1 Fine Silver Coin â€“ The Voyageur, features the iconic Emanuel Hahn reverse design of a paddling explorer and guide, which first appeared on the 1935 Silver Dollar issued in celebration of King George V's Silver Jubilee. Recalling the Mint's beginnings as a world-class refiner and celebrating our 110-year history are a pair of 2018-dated British Sovereign reproductions featuring Benedetto Pistrucci's classic engraving of St. George slaying a dragon. This timeless design is found on a 1 oz. fine silver coin plated in pure gold, as well as an exclusive 99.999% pure gold 1 oz. coin. Operating as a branch of Britain's Royal Mint until 1931, the Mint's Ottawa facility produced over 400,000 Sovereigns from 1908 to 1919, each bearing a "C" mint mark to indicate their Canadian origin. The 2019 $20 Fine Silver Coin â€“ Mystical Snow Day, a partially coloured and "shadow engraved" collectible designed by artist Steve Hepburn. 1-800-268-6468 in the US, or online at www.mint.ca. The coins are also available at the Royal Canadian Mint's boutiques in Ottawa and Winnipeg, as well as through our global network of dealers and distributors, including participating Canada Post outlets.